A much respected jazz musician, session pianist and record producer (whose story Cross Rhythms published a while back), Edwards offers here an outstanding album packed with top quality musicianship which conveys passion, tenderness, joy, emotion and conviction. There are moments on this album, such as during the full band sound of "Hymn To Freedom" and the powerful reworking of "Amazing Grace", when if you close your eyes you could be forgiven for thinking you are following a New Orleans jazz funeral procession. The authentic feel of this album is founded on classic sound of jazz from the deep south, whilst drawing influences from the wider world of jazz music, for instance in "I'll Wait And Pray" and "What A Friend We Have In Jesus" there is an improvised piano-based feel that you might expect to get in a smoky nightclub or jazz bar. Whatever your preference, from the opening piano and muted trumpet of "Battle Hymn Of The Republic" to the uplifting cover of Chris Tomlin's "How Great Is Our God" this is an album to savour. 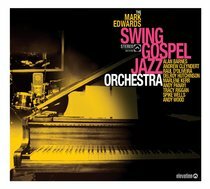 About "The Mark Edwards Swing Gospel Jazz Orchestra"